Discussion in 'Slashers' started by CPT HOOK, Aug 8, 2014. On August 19th, Image will be releasing the new slasher film Varsity Blood to DVD. Synopsis: This football season, Hogeye High’s Warriors and cheerleaders are out for blood. Unfortunately, someone is out for theirs, and they’ll be forced to take one for the team. After the big Halloween football match, the students are joined by an uninvited guest dressed as their high school mascot armed with a bow and arrow, a battle-axe, and an insatiable appetite for butchery. Soon, they find themselves fighting for more than the winning score as terror becomes the name of the game. Featuring “enough inventive kills to keep even the most rabid gorehound happy,” VARSITY BLOOD is “a supremely entertaining slasher rollercoaster” (Hysteria Lives!). I'm completely biased, because the writer/director is a friend and I'm even thanked in the end credits, but this is a really fun little whodunit teen slasher movie that is definitely worth checking out. It has the typical low budget warts, but it's much more fun than the standard straight-to-DVD slashers of late. Fun kills, loads of chase scenes, a likable cast of characters (plus a few less-likable but entertaining pot-stirrers), and a great Halloween atmosphere. After the opening kill, most of the first half is spent setting up the characters, red herrings, and backstory, but once things hit the fan, it really doesn't let up until the end. I'm hoping the slasher fans here will really have a great time with it. I know my friend (and me, as well) would really appreciate you guys checking it out. You can pre-order the DVD from Amazon for only $13.98. Or, if you don't have Prime, Wal-Mart.com has it for the same price with free shipping. $13.99 at Barnes And Noble, and $12.10 at BlowItOutaHere. Hopefully good sales will let distributors know that we like our slasher movies and would love to see more of them! Thanks in advance, and let me know what you guys think when you check it out. Stoked for this. Bloody Homecoming was fun in a small-town, low budget way that channeled a lot of the later 80s slash-fests. Here's hoping "Varsity" one-ups it. Bloody Homecoming was alright. Had its moments. But yeah, I hope Varsity Blood improves a lot. It certainly looks good. This one is much better than Bloody Homecoming, but again, I'm completely biased. DVDTalk just posted their review, and it's actually pretty favorable for this type of movie. Enjoyed Bloody Homecoming, looking forward to this one. Did the same people make Bloody Homecoming or something then? :eek2: I enjoyed that one. Be sure to Save it in your Netflix Queue too--that's like voting for them to carry it, which will also put money in the filmmakers' pockets (I think). Bloody Homecoming had a different director, but the writer of Bloody Homecoming wrote and directed this one. It's also the same production company and two of the same actors. In the trailer, many looked promising... Hope it lives up to that! Anyways, I'm definitely checking it out as soon as it appears. The cover looks lame. The photoshop work is really bad and the spearhead which points into the wrong direction is downright stupid. Looks like a rental with plenty of beer and friends. In one of the more... interesting... promos I have seen lately, Image has recreated the opening kill from Varsity Blood... using finger puppets. Today is the day! 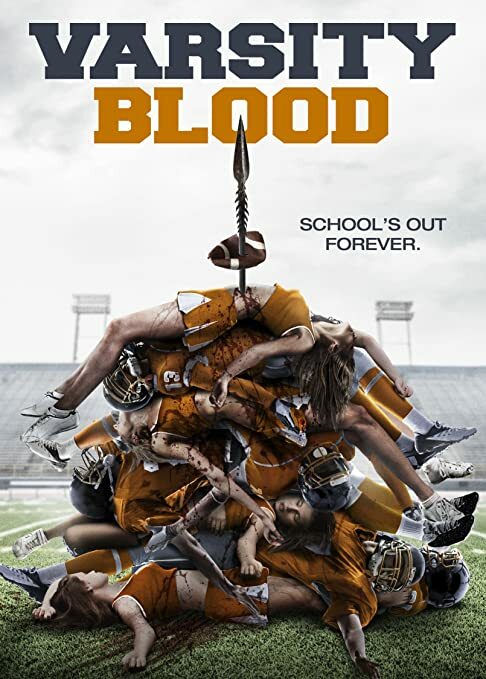 Varsity Blood is now available on DVD! Wal-Mart has it in store for $9.96, if anyone is looking for a good deal and is brave enough to wander in there. My copy is "out for delivery." I think I'll pass on Walmart, someone was shot and killed at my local one a few weeks ago. I was bored, the writing was bad but the killer's costume was cool. I think I prefered Bloody Homecoming, though production was better here. I don't care for either though.